/ How Do I Use LinkedIn “Find Nearby” at a Conference? 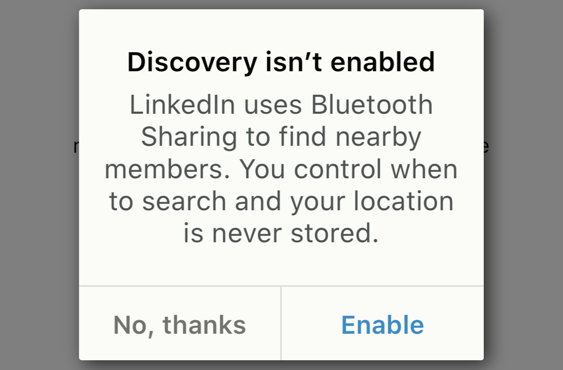 LinkedIn does indeed have a really cool “Find Nearby” feature that you can utilize to identify and connect with like minded peers at an event, but these sort of features are an exercise in trade-offs too. In a word, electronically identifying people near you is simultaneously a great concept in some ways and a privacy nightmare in others. There have been a number of dating apps, for example, that tried to make it easy to hook up with someone in the same bar or nightclub based on some basic characteristics, but they’ve generally not worked out too well. Then there’s the issue of apps that continue to run in the background – or always run in the background – and would therefore be basically transmitting your information all the time, even when you don’t want others to identify you or try to connect with you in the digital world. That can go from awkward to downright dangerous in our modern world. 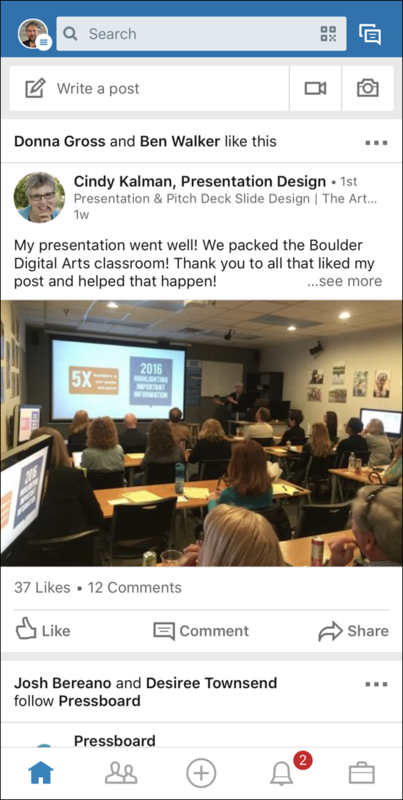 As I write this, I’m attending SearchCon, a terrific search optimization and digital marketing conference in Breckenridge, Colorado. We’re utilizing Find Nearby to connect on LinkedIn for future opportunity sharing and perhaps a new friendship or two. The above is what I see when I launch the LinkedIn app on my iPhone. Yes, you need to be on your smartphone and you need to use the LinkedIn app for this, you can’t just access LinkedIn via your mobile browser. 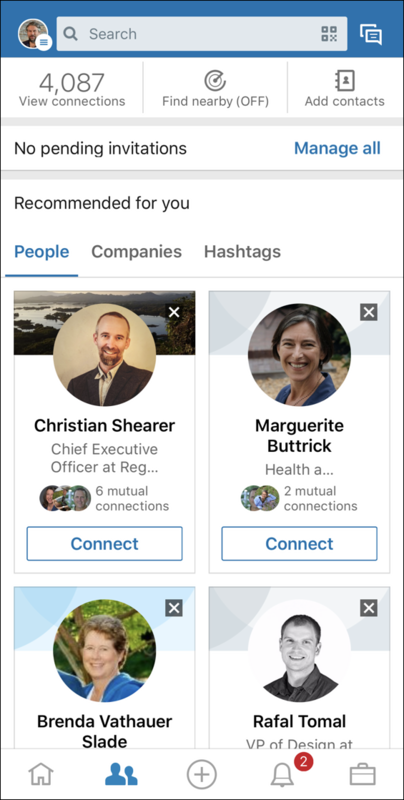 Yes, I really have over 4000 connections on LinkedIn, and you can see four that LinkedIn is suggesting I connect up with on the page too, in its “recommended for you” section. Right now I’m not interested in them, however! What I do want to tap on is “Find Nearby”, the center option in the top navbar, but notice it shows that it’s currently off. That’s good news: I don’t want to participate in this unknowingly. 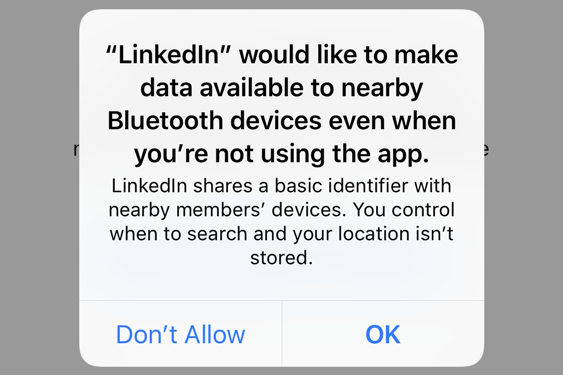 This is a bit more concerning because you have to trust the LinkedIn app to do the right thing. You can change it (somewhat) in iOS settings on an iPhone or in your Android phone system settings, but I wouldn’t grant this info to an app I didn’t trust. You might be more open with your data, however, so just be aware of the privacy tradeoffs before you proceed. Well, that’s disappointing, isn’t it? 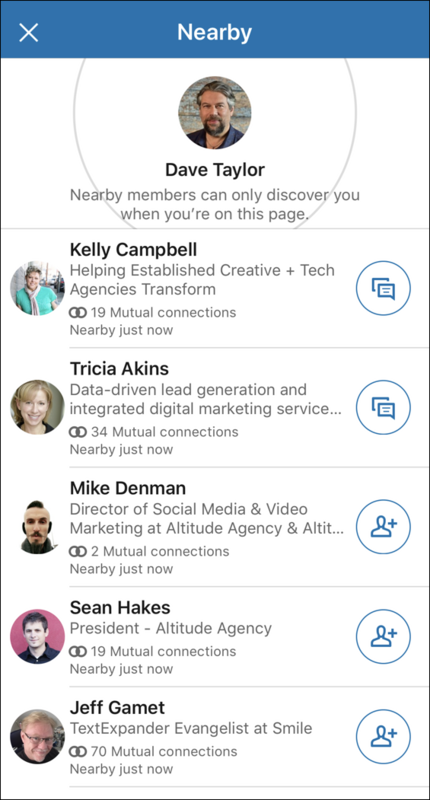 Turns out that it takes a little time to start finding others in your immediate area, and that’s assuming that they’re on the same page in their own LinkedIn apps too, of course. Look at the icons on the right of each person. I’m already connected to Kelly and Tricia so it’s a shortcut to message them, while Mike, Sean and Jeff are not yet connections, so the icon is a “request connection” one instead. So helpful – a single tap and if they agree to connect, they accept the request and we’re connected forevermore. A very neat feature when you’re at professional events, and when you leave this screen, it’s off and you’re back to your usual level of LinkedIn privacy. Pro Tip: I write a lot about LinkedIn, so please do check out my many LinkedIn help pages while you’re here on the site. Thanks!